Hate the look of crimps no matter how hard you try? Here's the answer!! Just fold these little jewels over the crimp, and it looks like a silver spacer ball!! 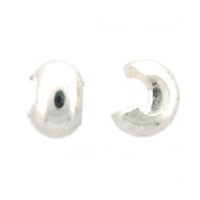 Measures approximately 2.4mm wide by 3.2mm around when closed.